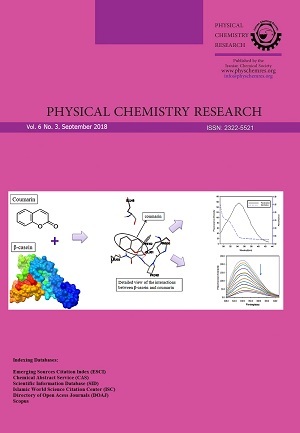 This paper is designed to examine the binding behavior of Coumarin with bovine -casein (βCN) through fluorescence spectroscopy and molecular modeling techniques. 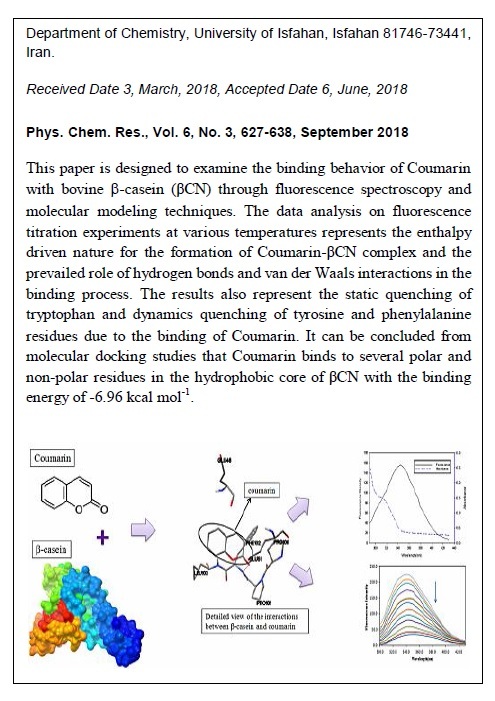 The data analysis on fluorescence titration experiments at various temperatures represents the enthalpy driven nature for the formation of Coumarin–βCN complex and the prevailed role of hydrogen bonds and van der Waals interactions in the binding process. The results also represent the static quenching of tryptophan and dynamics quenching of tyrosine and phenylalanine residues due to the binding of Coumarin. It can be concluded from molecular docking studies that Coumarin binds to several polar and non-polar residues in the hydrophobic core of βCN with the binding energy of -6.96 kcal mol-1. Finally, analysis of molecular dynamics (MD) simulation results suggested that the interactions between βCN and Coumarin are very stable and the binding of Coumarin restricted the flexibility of important residues in the binding site of this protein.